A friend of mine posted on Facebook that she had made these. They sounded so good that I asked for the recipe and she granted my request. I had 3 large peaches just begging to be used, so I halved the recipe & tweaked it just a bit. Preheat the oven to 350 degrees. Spray a 9×9 pan with non-stick spray; set aside. Sprinkle the peach halves with sugar after removing the pit. Take a bit of the pie crust and flatten it around the peach halves. There should be enough to cover it, but not too thick. 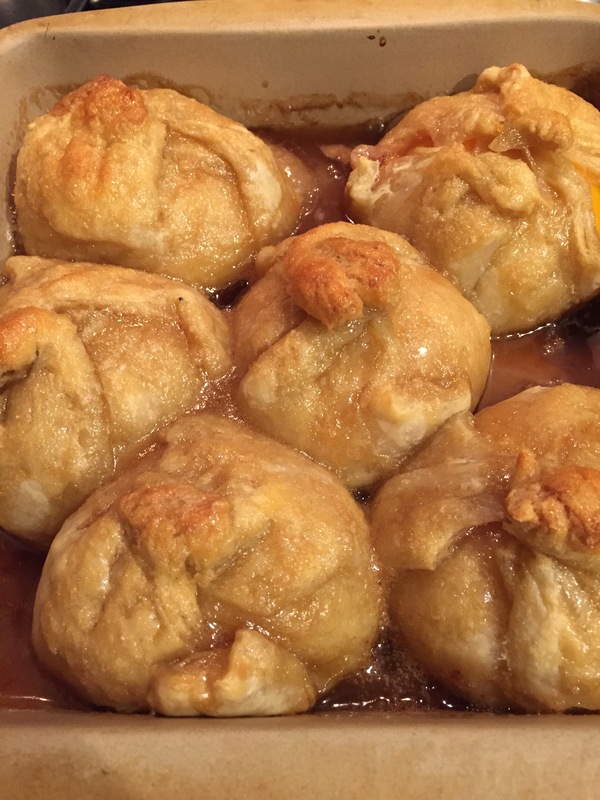 Place the peach pit side up on the dough and bring ends together, pinching off any excess. Place each dumpling seam side down. Bake for 30-40 minutes or until dough is browned and flaky to touch. Towards the last few minutes of baking time, in a small saucepan over medium heat, melt the butter, brown sugar, cinnamon, and vanilla extract and bring to a soft boil, for 1 minute and remove from heat. Remove the dumplings from the oven and pour the syrup over the dumplings. Return to the oven for 5-6 minutes so that syrup will boil, foam, and crystallize on top of the dumplings. Allow to cool for 10-15 minutes before eating.